The Four Walls Hunt is on! Read more at the hunt blog, but know that this is a hunt that you need to do. It’s quick and easy and totally worth a little bit of your time! 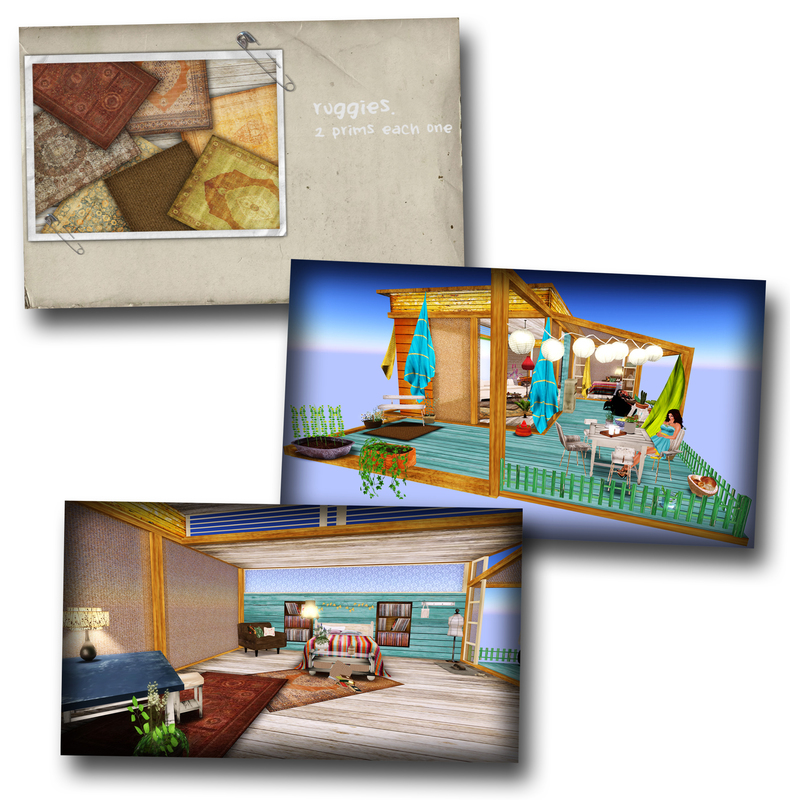 It’s all home and garden items, and pretty nice ones at that…check the “The Hunt” tab on the Four Walls blog to see preview pics of all the items, along with direct TPs AND hints to the item locations!! Easy peasy! I felt like decorating up some pretty little vignettes to highlight my favorite hunt items. See all the credits at the end of the post! 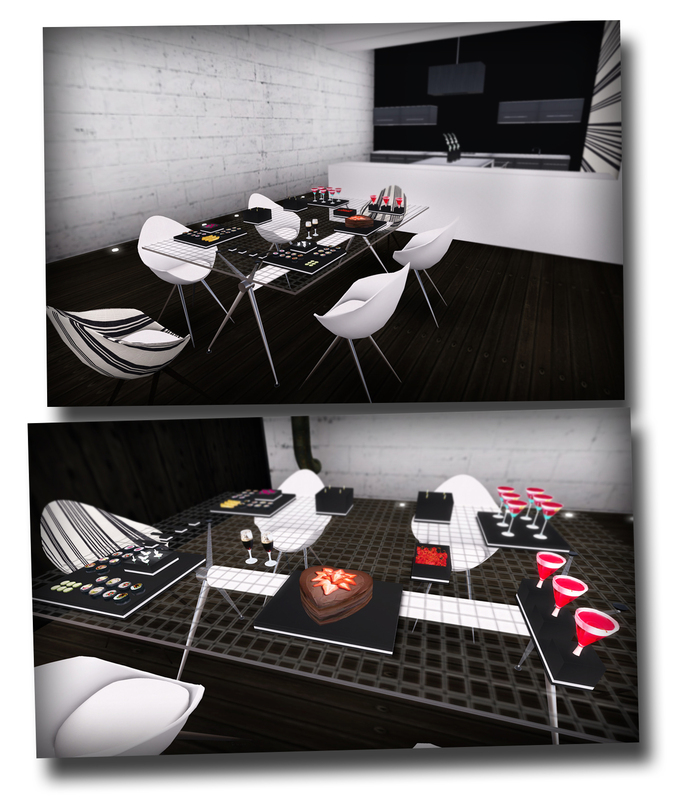 I received the new house out from Charlotte Bartlett of Scarlet Creative – yay! Although I don’t generally lean toward modern houses and furnishing, I’ve always enjoyed Charlotte’s work, and am so glad to see her back in action! The newest is the Adler, a sleek one-bedroom house with a little bit of an organic touch. *DISCLAIMER* For some unknown reason, the plants that are included with the house – at the entry and also in the living room – just will NOT rez for me. Ever. I contacted Charlotte about it, thinking maybe they were temp textures left by accident…she checked, confirmed all was right, and sent me a new copy just to be safe…but they still won’t rez for me. I suspect it’s MY problem, though, and not an issue with the house. There’s a great entrance hall when you step inside – prime decorating opportunities, I’d say. …and a nice large kitchen and dining area on the opposite side. The black accent wall is very striking in this space – love! The living room is tucked into the back corner of the house, and I like that. Makes it feel more like an escape when you’re not stepping through the front door and right into that living area. We’ve got the black accent wall here again, as well as a really cute built-in fish tank. I also love the bookshelves built around the fireplace – great for putting stuff on surfaces! 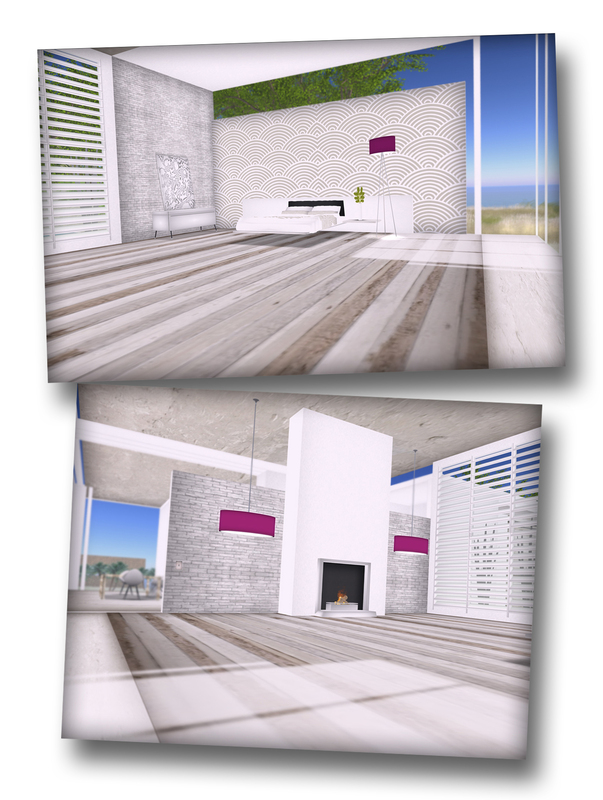 Charlotte has included some great shading and lighting in her textures, which gives this house great depth. That’s critical when you’re dealing with a color palette like this. The white walls can seem a bit stark, but nothing that can’t be counteracted by some great pops of color in your decorating. And again, because Charlotte has included the black accent walls, as well as a few shots of fun wall paper, the white is never overpowering. 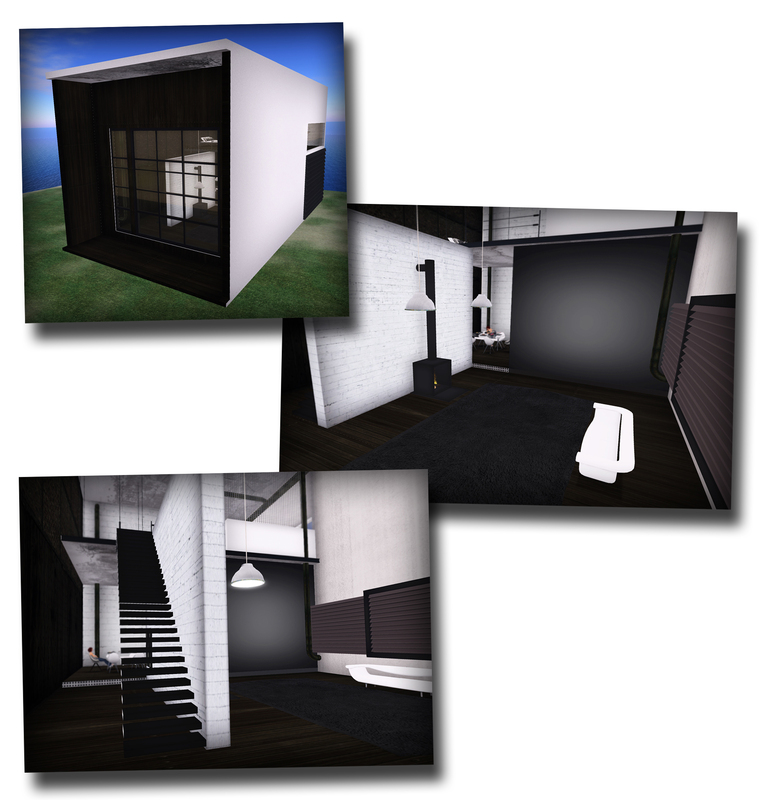 You can find the Adler on Marketplace or in-world – a furnished (shown here) or unfurnished version! What’s old is new again – and at crazy-great prices! That is an awesome deal for any of Charlotte’s stuff. Her houses are creative and well-built and great for those who want something glam, modern, and clean. I like that the houses show some baked shadows – that’s critical for these big open spaces. Some of the furniture could use a bit more depth and shading to suit my taste, but it’s all very in keeping with that streamlined minimal look. I love all the water features throughout the houses! Grab these great Scarlet Creative deals on Marketplace! This year it is going a little back to our roots. The urban style home. 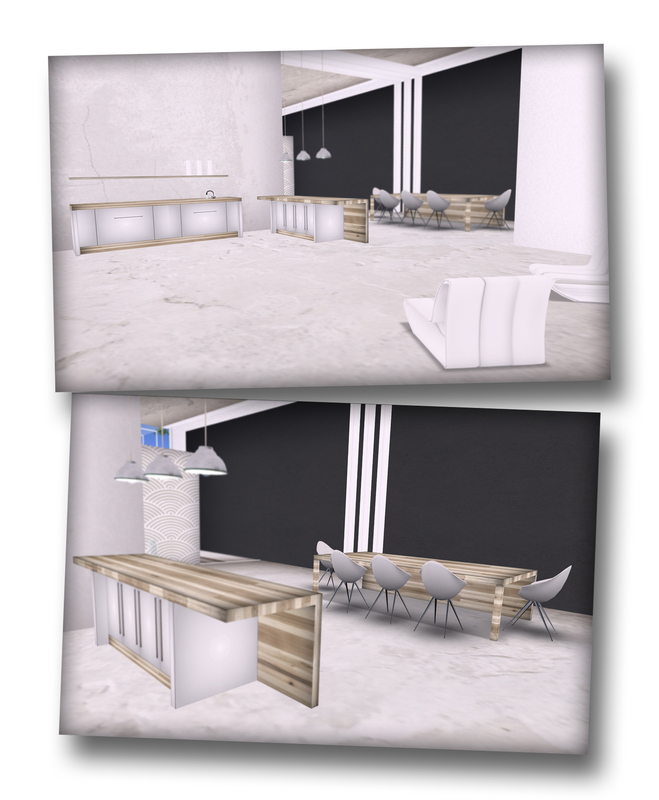 The range will start with a skybox “Becoming More Like Alfie” and comes in two options, shell or with furniture. Following the skybox will be a further range from sleek spa style properties for the beach through to a new grand prefab. As much as I’m a shabby chic kind of girl, I’ve also always appreciated well-done urban style. The “Becoming More Like Alfie” skybox is a great example of urban simplicity – lots of character, but still a fairly empty canvas to allow you to inject your own character and personality. A nice big open concept floor plan – and I love how the stairs are off in their own little hallway, but still open to the dining area in the back. Great for traffic flow. 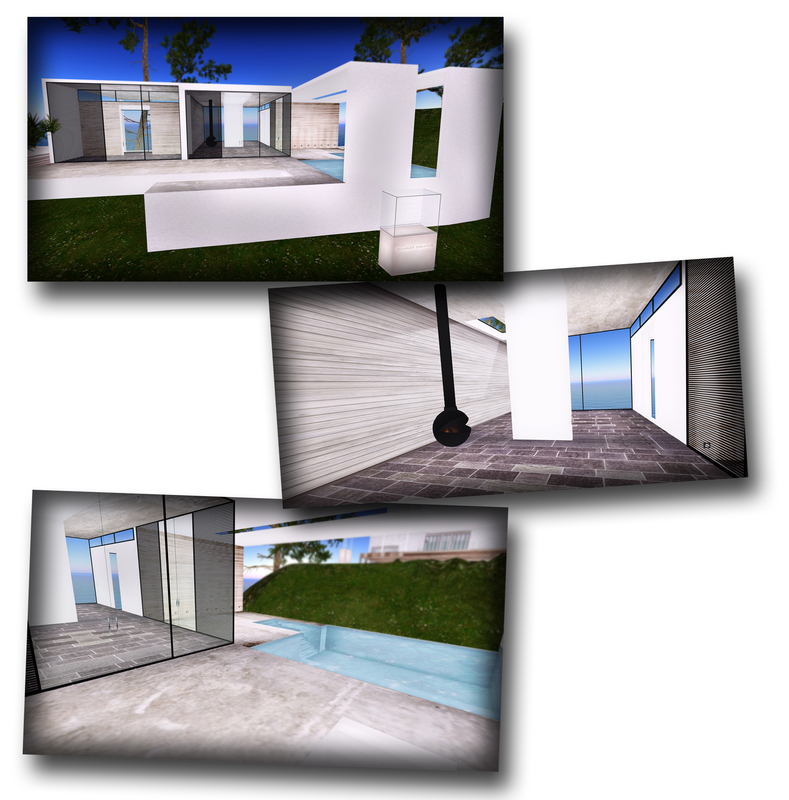 I like the super large window on the front, as well – even skyboxes need a view! 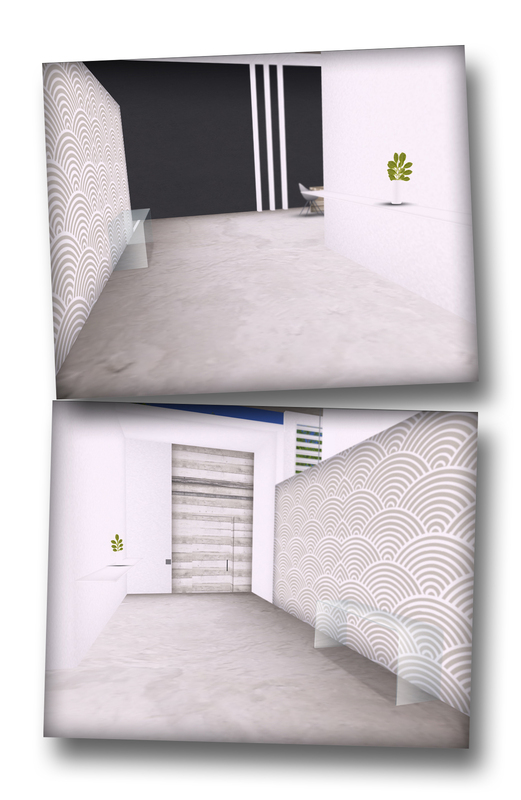 Throughout the skybox, you can change the look of the windows, as well — open or closed blinds, dark or light opacity, etc. …and then breakfast in the kitchen the next morning. I like the striped wall in the kitchen – it’s a nice accent and a fun way to break up the white brick (which I also like). I also included a close-up here of the fire place in the living room…and you can see there, again, the nice flow from living to dining. Upstairs is an open loft bedroom – love the suspended platform bed – and an open bathroom. 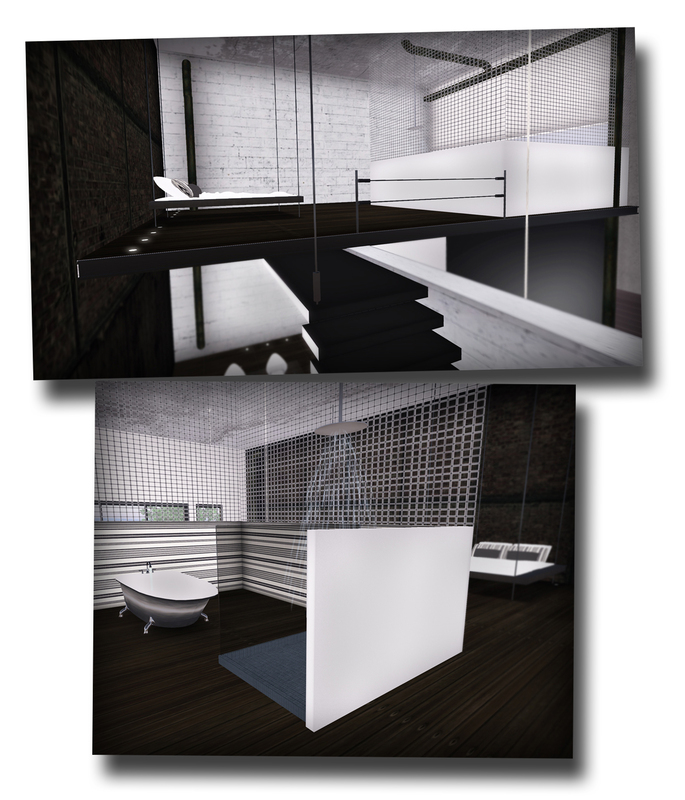 More simple and clean lines, and the use of wire mesh for the upper part of the bathroom walls is creative – glass half-walls would have been great, too, but the mesh is unexpected and that makes it cool. 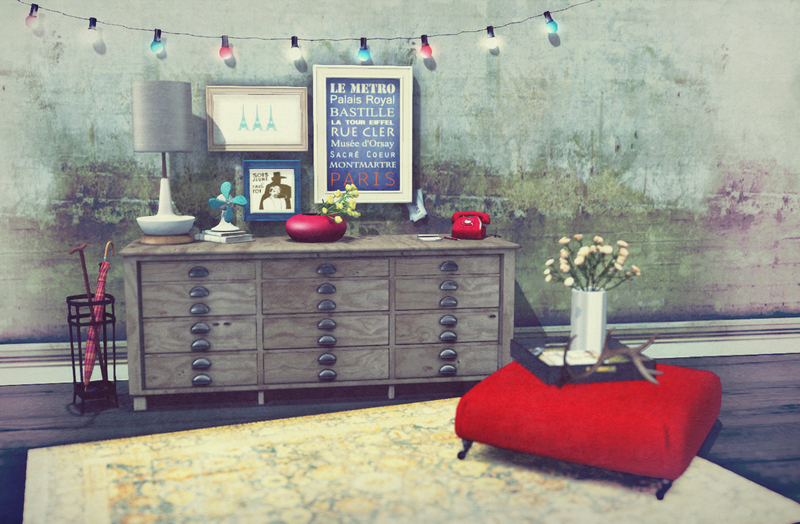 You can see “Becoming More Life Alfie” now at Scarlet Creative [SLurl], and keep a look out for more new releases in the urban line. Just a few quick, new(ish) things from around the grid. I wanted to get this post in before all the Home Expo madness starts tomorrow. What Home Expo, you ask? Well…. [Insert squee here!!] 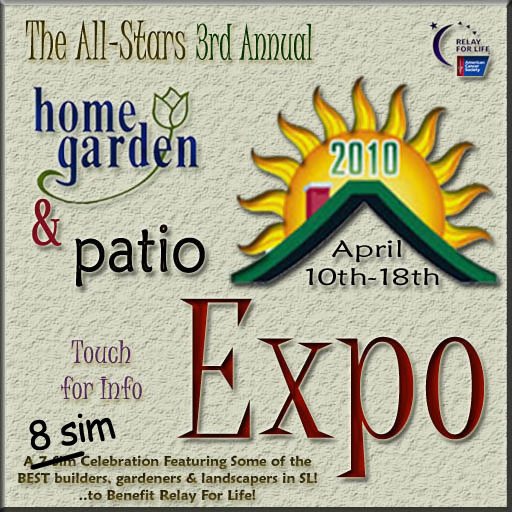 Home Expo 2010 starts tomorrow!! Eight sims worth of houses, furniture, decor, landscaping…nirvana! Check back here in the morning, and I’ll give you the LM! NOW, on to the new(ish)ness from around the grid. First up, Jordan Giant of nordari. 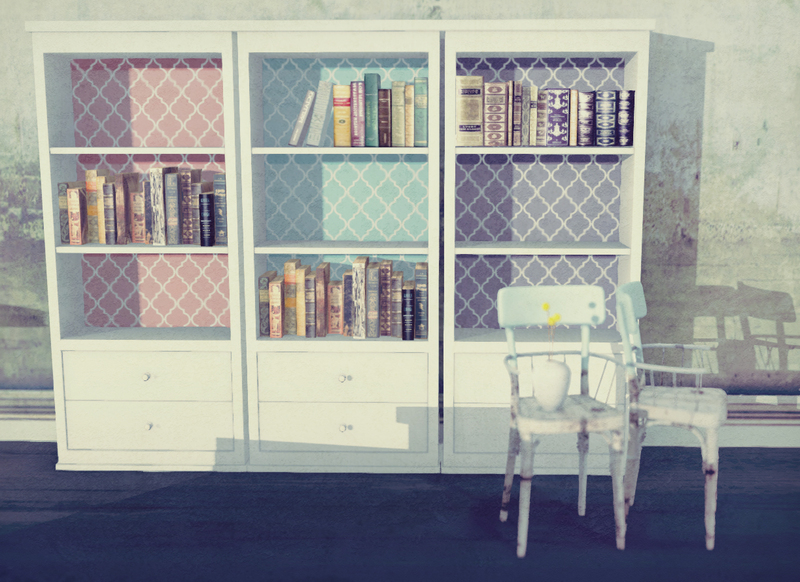 has released another adorable skybox – the banana.pancake . You can also find these adorable rugs FOR FREE at her shop! Spring has come to New Trails! 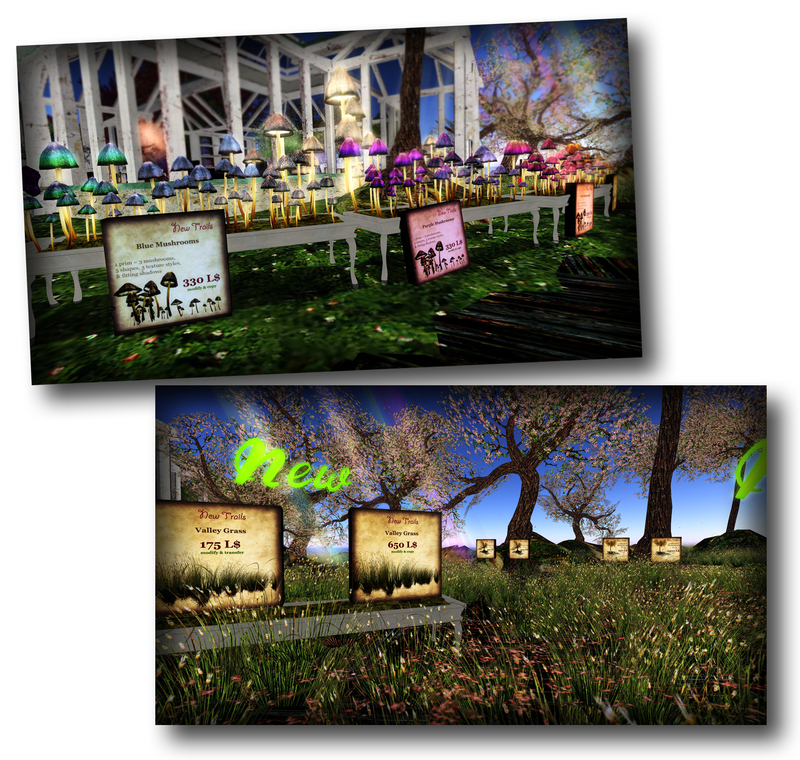 New grasses, new trees, and a rainbow of mushrooms from designer Vitrail Illios! Charlotte Bartlett of Scarlet Creative has just released the Artisan Ubon house – a simple, elegant modern prefab. It’s a little on the smaller side, which I really like – a living area and 2 bedrooms, and tons of natural light. Don’t forget – check back here tomorrow morning for a LM to the Home Expo! Whee!